These words appear on a sheer white panel of polyester chiffon, which forms the focal point of a textile installation by Jamie-lee Linnitt and Evangeline Dauber created to raise awareness of domestic abuse. Linnitt and Dauber are studying for the BA in Illustration at Norwich University of the Arts and they began to collaborate in their final year on the course, and together have produced a final piece which is brave, beautiful, carefully-considered and sensitive. How to deal with disturbing subject matter, how to intrigue and draw people in and not have them turn away, how not to sensationalise or trivialise? These are questions that preoccupied the artists, known collectively as SHE KNOWS, as they began to shape the installation. Bravely they chose to tackle the subject of domestic abuse by using that most domestic of materials – the textile. Also the most feminine of materials. 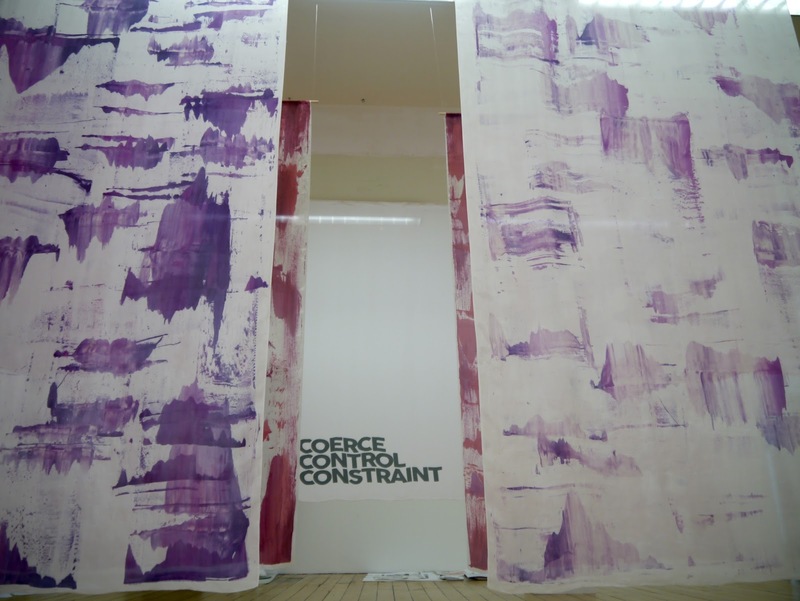 Linnitt and Dauber knew they wanted to created a work which would be immersive, which viewers could walk through and round, which would lead the viewer in. They wanted the work to be soft and beautiful to look at, in order to wrong-foot the viewer just as the abuser often wrong-foots the abused. 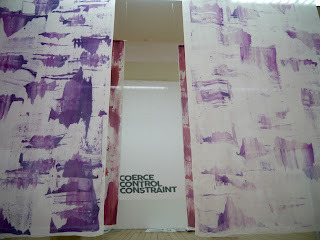 The installation is comprised of four large panels with two smaller panels sandwiched between. 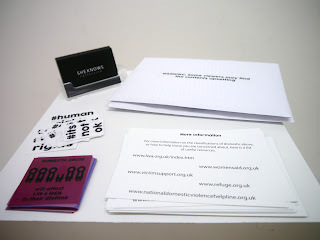 At the rear, is the single white panel with the three words. The large panels are made of silk habotai, hand-painted with procion dye. The marks, made by squidgies and brushes, are in purple and red, the colour of bruising. The smaller panels, made from silk viscose satin, are a deep red, patchy and various as fibres have been removed using a process called devoré. No figurative images but instead abstract, suggestive patterning. The panels are hung together in a way which echoes a family grouping. The larger panels hang from near invisible strings, so they float and have something shroud-like and ghostly about them. They twist and turn as people pass as if they are twisting and turning from the viewer as if shy or frightened. The panels have the fluidity of skirts, of dresses, and remind the viewer of the female, the feminine. The panels are in a symmetrical arrangement of twos with an aisle leading through the centre. So another association is made; this time with the banners which line either side of an aisle in a Christian church. From this it doesn’t take much to make a link too with weddings, with walking up the aisle to be married. Except there isn’t a priest at the altar but those three powerful words. Linnitt and Dauber say they selected the words for the alliteration, but also that they convey the tactics an abuser may employ. 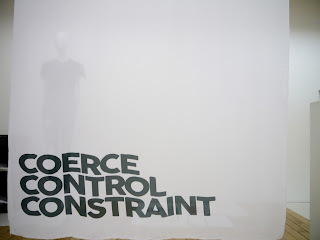 Coerce, Control, Constraint. To the viewer too the words bring coolness. This is the language of academic studies, of the official document, legal papers, the police force. The font chosen is called ‘cocogoose’ and it is in bold. It was chosen for its clarity and because visually it suggests intensity and restriction. The text contrasts sharply with the softness of the text-ile. Three words. Perhaps the most famous three words in the English language are I Love You and often, sadly, these can be the precursor to domestic abuse. These artists are working in the tradition of Barbara Kruger (feminist slogans), Tracey Emin (fascination with words and textile), Louise Bourgeois (preoccupation with the body, pain, the textile and words). 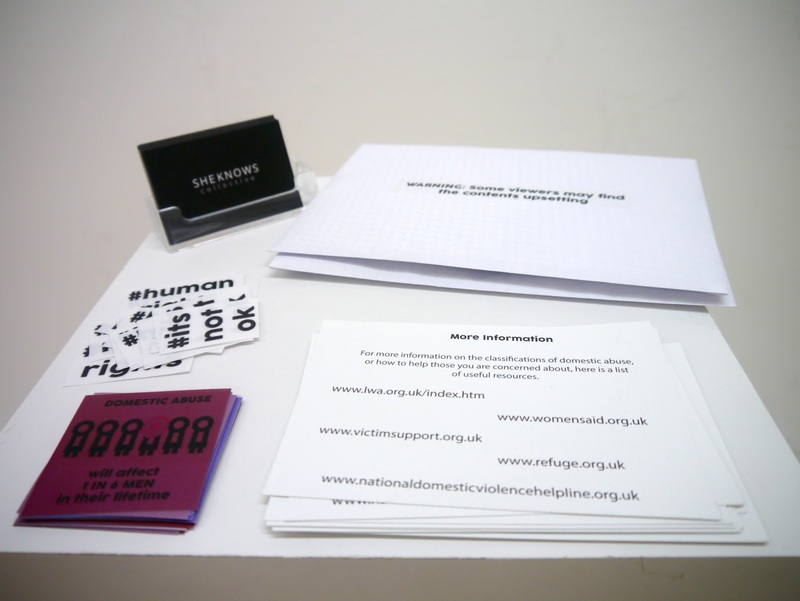 Accompanying the installation are information packs containing statistics about domestic abuse, contact numbers for help etc. These young women have considered everything, and should be applauded for creating a work which resonates. Jamie-lee Linnitt and Evangeline Dauber as SHE KNOWS plan to sell artwork in order to raise money for selected charities. They also plan to hold their own exhibitions in the near future. Keep an eye out for their updates at skcollective0.wixsite.com/sk-co-, or via Instagram, @sk_co_. If anybody would like to talk to them about their work please contact at sk.collective@hotmail.com, or use the 'Contact' page on their website. Jamie-lee Linnitt is 24 and currently living in Attleborough. Since rediscovering her love of textiles in the last year or so, it has become her main approach to creating work. Her dissertation focused on how effective the use of textiles is when communicating Feminist theories. Feminism is integral to her work and she is interested in all aspects, from body positivity to the treatment of women in varying cultures. Evangeline Rose Dauber is originally from Lincoln, but has been living in Norwich for the past few years studying Illustration. Her personal practice focuses on female empowerment and challenges the equality between genders. She likes to work mainly in pink and blue to push the stereotype of male and female expectations. Having only just found her feet in textile design, she has a lot more to give and can’t wait to get started on further projects!